Niger River and African oil palms along the shore. Niger river is the third longest river in Africa, only the Nile and Congo rivers are longer. The Niger has one of the most unusual routes of any of the major rivers in the world. It starts approximately 150 miles from the Atlantic Ocean (240 kilometers). Instead of flowing to the nearby Atlantic Ocean it instead heads inland, away from the sea into the Sahara Desert. It turns sharply near the city of Timbuktu and heads to the Gulf of Guinea. Unlike the Nile, the Niger is very clear. This is because its source contains very little silt. 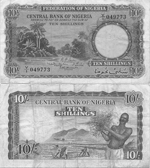 The countries of Niger and Nigeria get their names from the river. The river has thirty six families of freshwater fish and nearly 250 species, 20 of which are found nowhere else on Earth but the Niger. The West African manatee, which faces extinction, lives in the river. These mammals can grow up to fifteen feet long and can weigh nearly eight hundred pounds. It is hard to imagine the landscape of the Coastal Plain Nigeria without oil palm. This slender tree brings great benefit to man. All palm use - from the bottom to the top, but its most valuable fruit from which the oil palm. 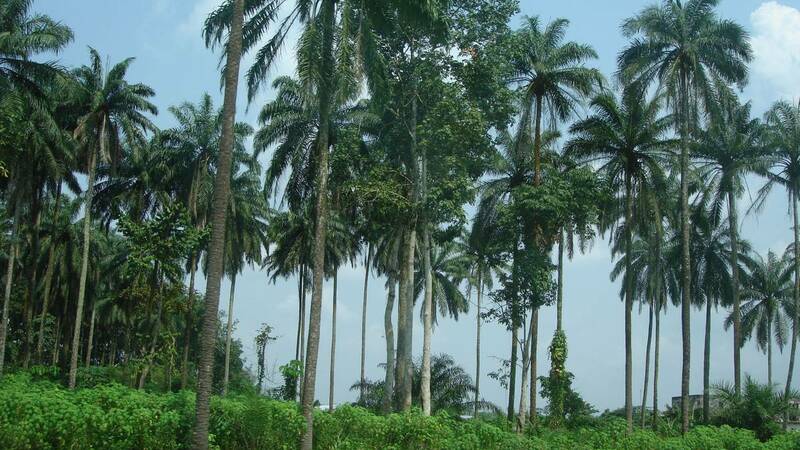 Oil palm is widespread in the forest zone and the north - the valleys of the Niger and Benue. But it is most favorable for the area to the east of the lower Niger, where oil palm forms a continuous belt. 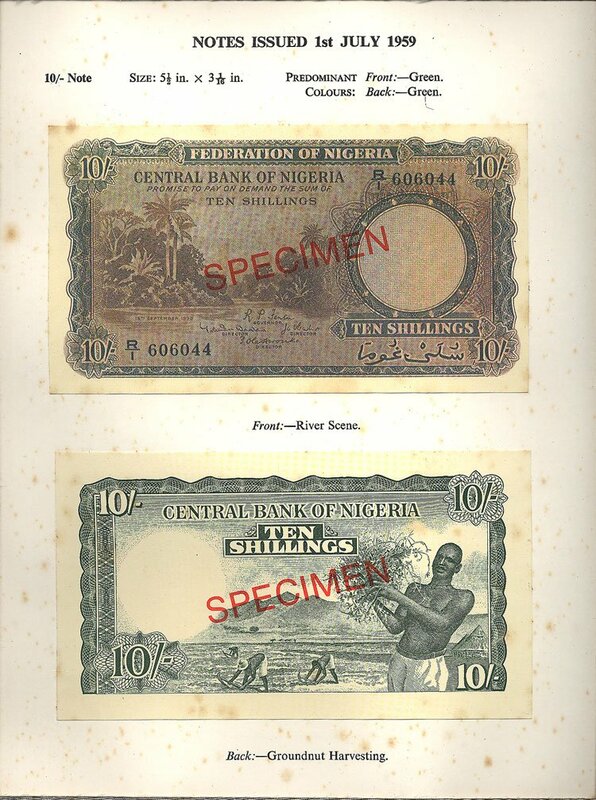 Near Sapele and Calabar are oil palm plantations belonging to the "United Africa Company." Most of the oil obtained from the fruit of wild trees. Fruiting palm with five-six years of age. It brings two harvests a year. fruit bunches weighing 10-20 kg. and consist of several hundred dark red fruits. Oil is usually prepared manually. Fruit, peeled nuclei pounded and boiled with water. The supernatant water on the surface of the oil is removed. In this way it is possible to obtain not more than 50% of the oil contained in the fruit. When used hand press, oil yield increased to 65%. 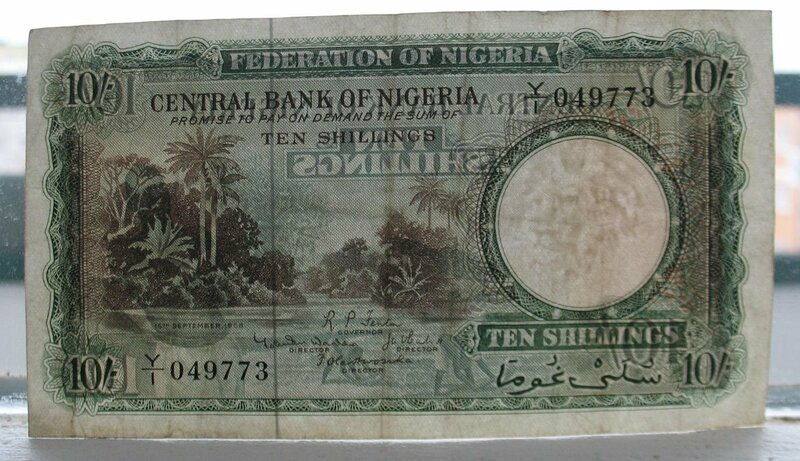 However, inaccessible to most Nigerians hand press. Kernels palm fruit also contain valuable oil. They stored well, so they are easy to transport over long distances: almost the entire harvest of palm kernels exported. Processing of oil palm fruits is monopolized by "United Africa Company." In the production and export of palm products Nigeria ranks first in the world. It accounts for half of the total number of cores and a third of palm oil supplied to the world market. 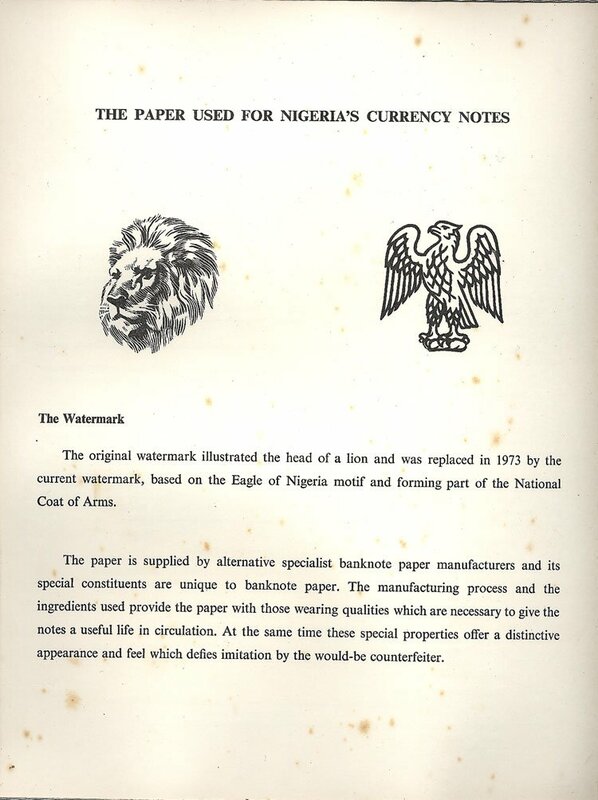 In 1959, the country produced 470 thousand tonnes of palm oil, and exported 173 thousand tonnes. The export of palm kernels was 437 thousand tonnes. 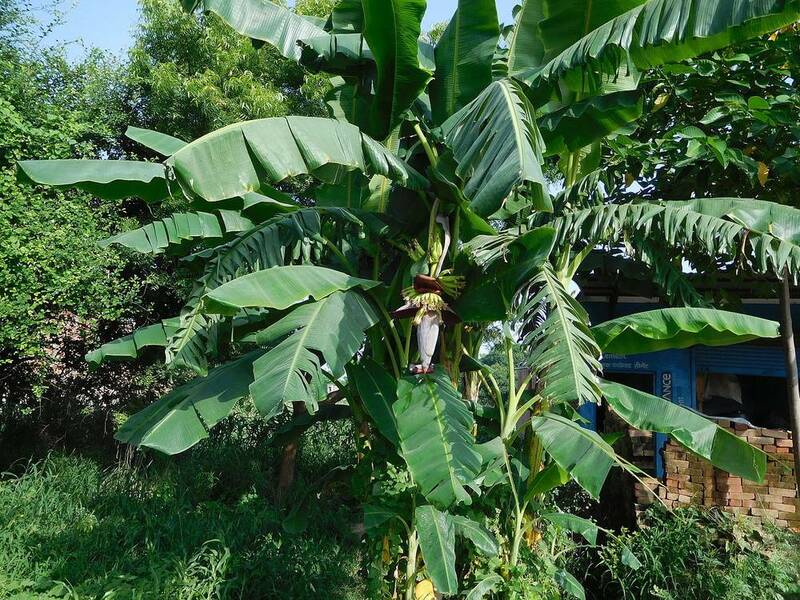 To the left of African oil Palm is the Banana tree (Musaceae). The Musaceae are a family of flowering plants, placed in the order Zingiberales. The family is native to the tropics of Africa and Asia. The plants have a large herbaceous growth habit with leaves with overlapping basal sheaths that form a pseudostem making some members appear to be woody trees. In most treatments, the family has two genera, Musa and Ensete. 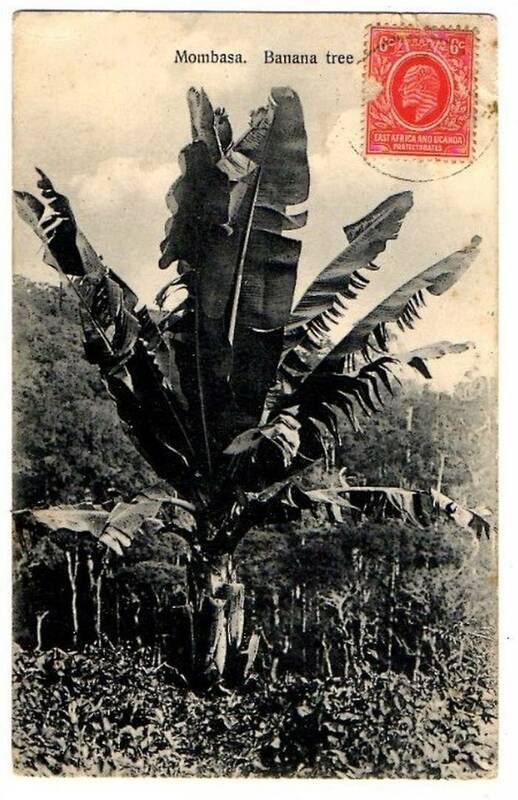 Cultivated bananas are commercially important members of the family. Denominations in numerals are in all corners. In words in lower right corner. "Usually it is grown in crop rotation with cereals, because it helps to efficiently use nutrients and reduces the number of diseases transmitted through the soil." 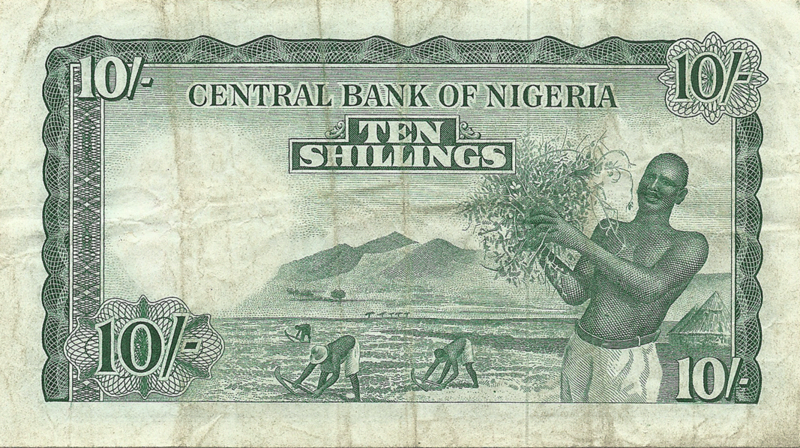 In the background - a peanut field in northern Nigeria, the peasants working with hoes. 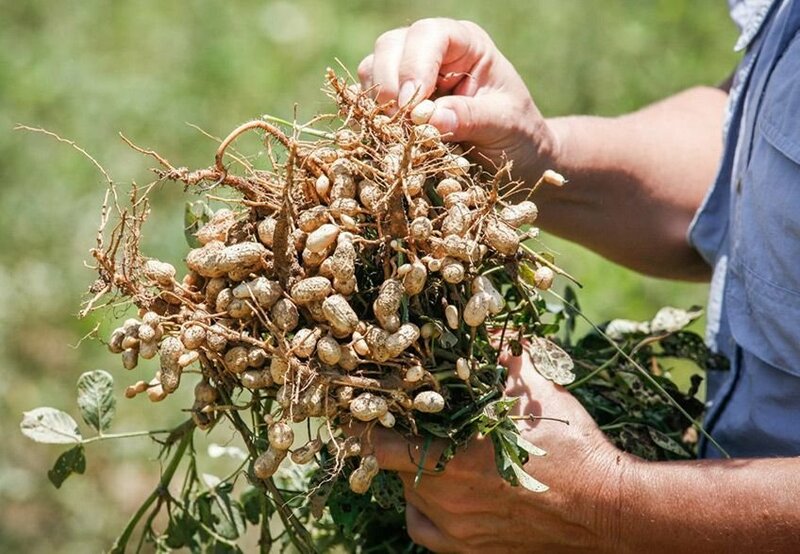 Groundnut or Peanut (Arachis hypogaea) is a major crop grown in the arid and semi-arid zone of Nigeria. It is either grown for its nut, oil or its vegetative residue (haulms). Recently, the use of groundnut meal is becoming more recognized not only as a dietary supplement for children on protein poor cereals-based diets but also as effective treatment for children with protein related malnutrition. It is the 13th most important food crop of the world and the 4th most important source of edible oil. Its seeds contain high quality edible oil (50%), easily digestible protein (25%) and carbohydrates (20%) (FAO, 1994). 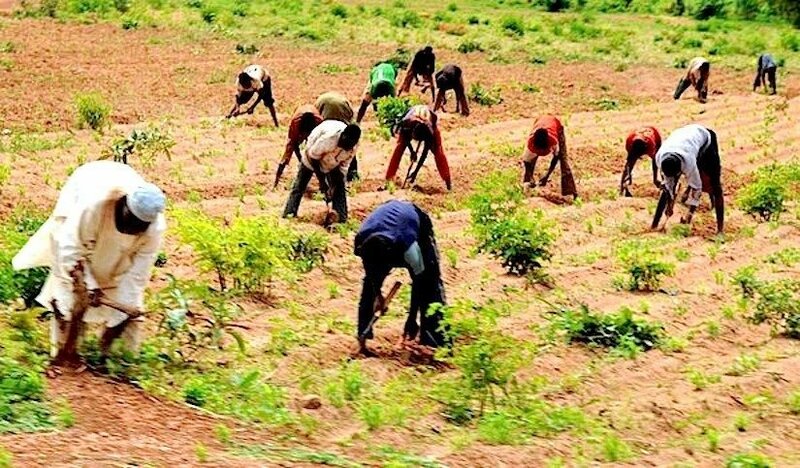 The crop is mainly grown in the northern part of Nigeria; over 85% of the groundnuts produced in the country were accounted for by Kano, Kaduna, Taraba, Bauchi, Bornu, and Adamawa states (Abal and Harkness, 1978). Peanut sauce, prepared with onions, garlic, peanut butter/paste, and vegetables such as carrots, cabbage, and cauliflower, can be vegetarian (the peanuts supplying ample protein) or prepared with meat, usually chicken. Peanuts are used in the Mali meat stew “maafe”. In Ghana, peanut butter is used for peanut butter soup nkate nkwan. Crushed peanuts may also be used for peanut candies nkate cake and kuli-kuli, as well as other local foods such as oto. Peanut butter is also an ingredient in Nigeria's "African salad". Peanut powder is an important ingredient in the spicy coating for kebabs in Nigeria and Ghana. Groundnut is grown in a well-drained sandy loam, or sandy clay loam soil. Deep well drained soil with high fertility. An optimum soil temperature for good germination is 30C. it is usually grown in rotation with cereals as it help in efficient nutrient utilization and reduces soil borne diseases. Land preparation should ensure that all crop residues and weeds are completely buried; ploughing and harrowing are also carried out to make a seed bed of fine tilth for proper germination and growth of crops. It could be sown on ridge or on flat. The recommended spacing for groundnut is 75 cm. between the rows and 25 cm. between the plants within the rows. Fertilizer can be applied at the rate of 54 kg./ha. P2 O5 and 25 kg./ha. K2O for good crop production; and can be applied before or immediately after planting. Planting should be done as soon as possible after the onset of the rains. Early planting is recommended to avoid rosette attack. The major pests attacking groundnut include: groundnut borer, red flour beetle, almond moth, termite, white grub, jassid, aphid, tobacco caterpillar etc. There are a number of diseases that affect the crop some of which include: groundnut rosette, groundnut streak, bacteria wilt, anthracnose, fusarium wilt, pod rot etc. Groundnut rosette disease is one of the most destructive diseases of groundnut in sub-Saharan Africa, which is transmitted by Aphids, although rosette epidemics are sporadic, yield losses approach 100% whenever the disease occurs in epidemic proportions. For example, an epidemic in northern Nigeria destroyed approximately 0.75 million hectares of groundnut with an estimated loss of US$250 million in regional trade (Yayock et al. 1976). However, significant research has since develop preventive and control measures to ensure good production and sustained yield. Leading to the development of 23 new varieties, which were released in 2011; some of which are resistance to rosette and drought-resistant. Harvesting usually consists of a series of operations comprising digging, lifting, windrowing, stocking and threshing. Some of these tasks can be combined or eliminated depending on the system applied. 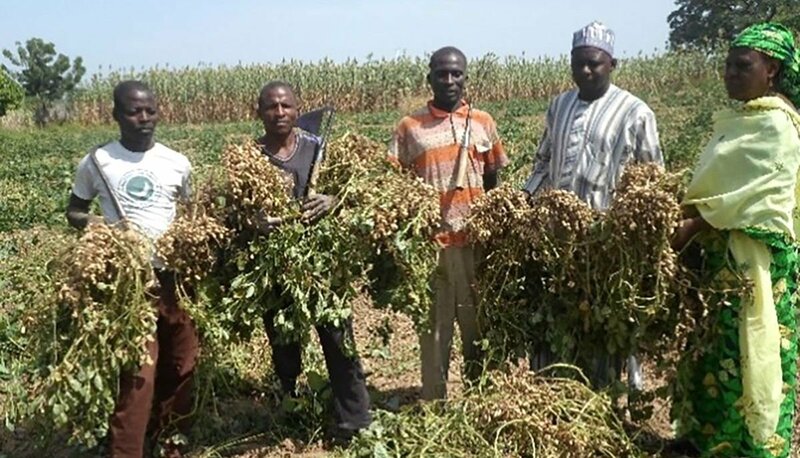 Among the field operations concerned with groundnut cultivation, harvesting is the most laborious and costly endeavor. 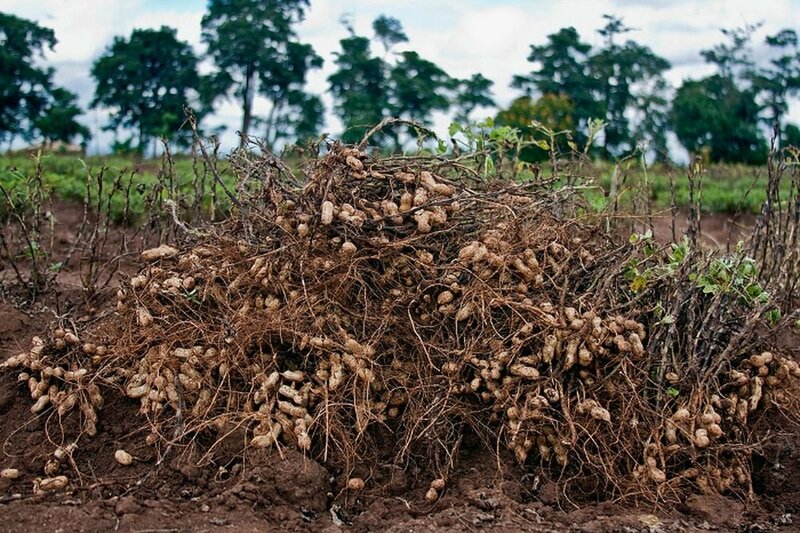 Harvesting should be done when the crop reached physiological maturity i.e., when a few leaves turned brown and the inner ribs of the groundnut were a pronounced brown in color. All the pods are recovered when pulled out of the soil. Harvesting may sometimes become a problem especially when the crop has passed the stage of full maturity and the soil has hardened. An appreciable number of pods could be lost if not meticulously carried out; which make the harvest labor intensive. 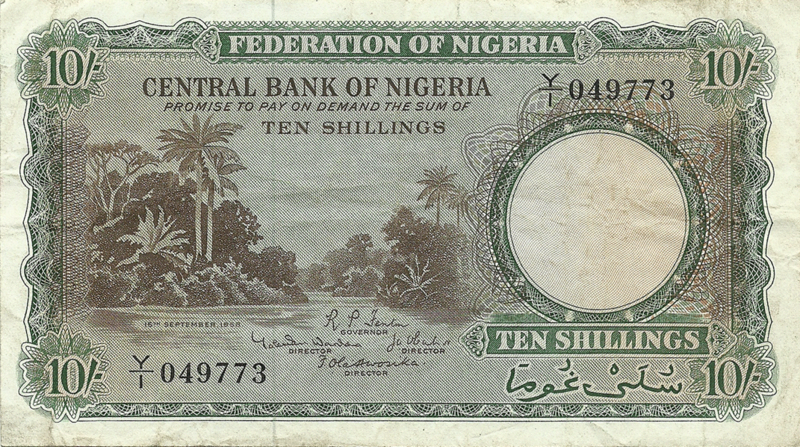 In lower right corner is a house, typical for Northern Nigeria, visible. Most houses in Northern Nigeria have flat roofs so that people are able to sleep on them at night due to the hot weather. 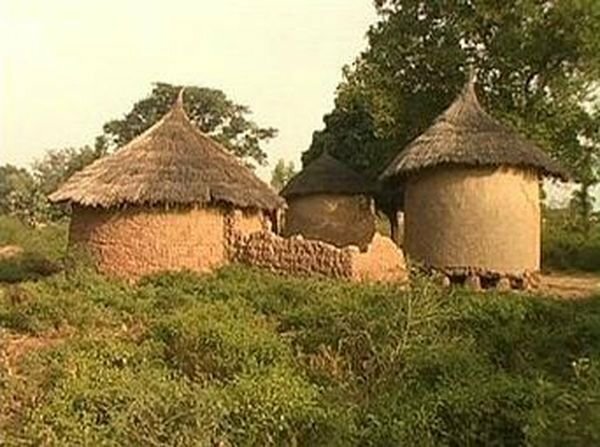 Their houses are round and are built out of mud.